June 2016 We have had a feature both in your Home and Garden and Your Womans Day.Our Nursery Items in hot demand. The White Teeny featured in a natural and neutral-gender theme stole the show while accompanied by the curious Giraffe. 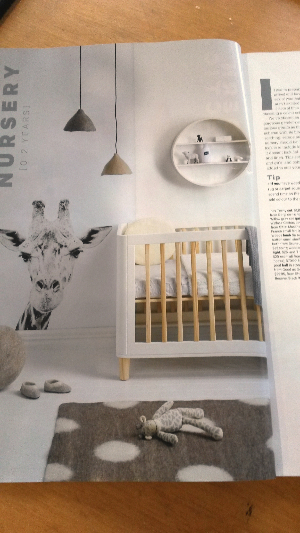 The Ellie Rose Gold cot was a hit with Alice and Caleb, used in their nursery with new bubs and featured in your womans Day. and In providing beautiful linens to the NZ market Gorgi has enjoyed tremendous support and coverage from a broad selection of media titles, blog and online review sites. We are proud of the feedback we have generated by respected opinion leaders and want to share some of our stories with you. A feature on trends for kids rooms from NZ Interior Designers and brands. Gorgi Designer, Kirstin Bailey comments on colours and more future-proof looks including retro, romantic, sustainability and nature, and vintage. A story featuring Gorgi Designer, Kirstin Bailey's Home in Onehunga Auckland, click on the link below to download the PDF.